Ryan’s Smashing Life’s Smashing Soiree @ T.T. the Bear’s Place – TONIGHT! Never mind the sold out Decemberists show at the House of Blues. 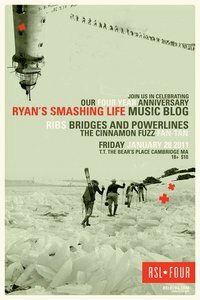 If you’re looking for a serious party for your Friday night, look no further than T.T.’s, because they’ll be hosting the Ryan’s Smashing Life 4-Year Anniversary Celebration, featuring RIBS, The Cinnamon Fuzz, Bridges & Powerlines, and Fan-Tan. Hang out with the winners of the Boston Music Award for ‘Best Music Blog’ and check out some great bands! 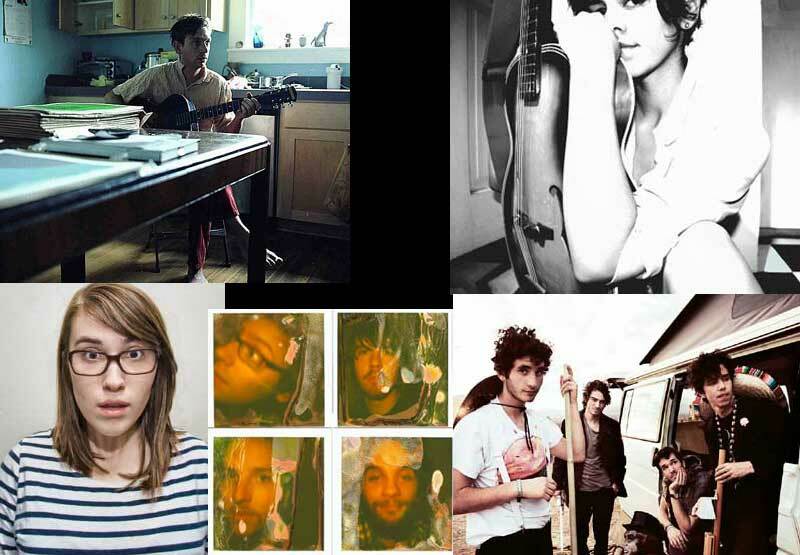 Welcome to the first band roundup of the year, though we won’t say how long I’ve had these fine bands sitting in my inbox… In this first installment, there’s the dreamy space jams of Woodsman, beautiful harpist and folk singer-songwriter Meredith Godreau a.k.a. Gregory and the Hawk, and the mysterious desert music of Infantree. A warm, acoustic, both serene and haunting ‘comfy as an old pair of shoes’ EP from Sonny & the Sandwitches, and someone I’ve been impressed with for some time now, Danielle Ate The Sandwich. The Airborne Toxic Event’s New Single “Changing” & more on the way! The new album: All at Once (Island Def Jam), to be released on April 25th in Europe and April 26th in North America. The tour: February residencies and shows in Europe – see full schedule. Additional dates to be announced February 15 on their official site – and I’ll post them here as well. On tomorrow’s Expanding Awareness show Victor will be joined by astrologer Dietrich Pessin, who will be discussing the year ahead (and making some predictions, so bring along your notepad). Tune in at 10am to WZBC 90.3fm or wzbc.org. If you miss it, you can also listen after the fact by visiting the WZBC Archive (all of ‘ZBC’s shows are online for two weeks). Catching up on some cool music. One of the coolest of all – a new demo from College Kids, the new musical collaboration of Rademacher‘s Malcolm Sosa and Kim Haden (of Yellow Alex), whom I first mentioned last October. Seriously, I want to see Mr. Sosa in some sort of incarnation here on the East Coast so badly, I’ll take anything – Rademacher, College Kids, or a Vaudeville revue passing through town. Big Boston Band Night Out – tonight! 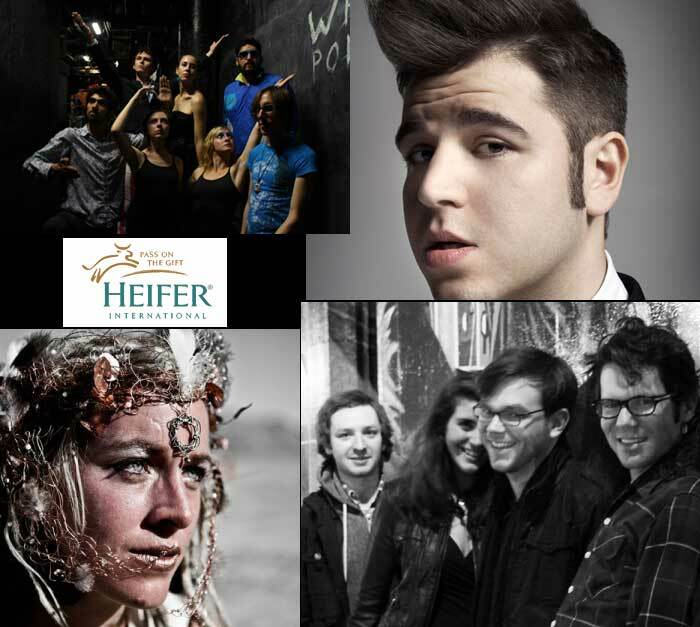 Yep, big doings tonight for the local Boston music scene. Predictably, I’ll be working. But you should definitely get out tonight. Don’t get bummed if you don’t have tickets for the sold out Deer Tick guys; there’s other noteworthy stuff going on – a brand new club’s opening night (with live music – and FREE admission! ), and a bunch of local bands playing for a worthwhile charity. The odd and quirky world of Darwin Deez leaves orbit and lands at Great Scott in Allston on Thursday (Jan. 13), on tour to support his upcoming debut, due out February 22 on Lucky Number. 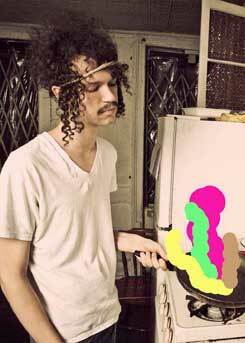 Originally from Myrtle Beach, South Carolina (born to Meher Baba disciples, which surely must mean something), he’s now based in New York, where he developed his unique blend of goofy synth-pop, sing-song vocals and clever lyrics that put a happy coating on vaguely melancholy, slightly cynical sentiments. In “Bad Day,” a song written to some guy who stole his girl, he whimsically sings, “I hope that the last page of your 800 page novel is missing, I hope that your team lost.” It’s this type of juxtaposition that gives him that subversive charm. 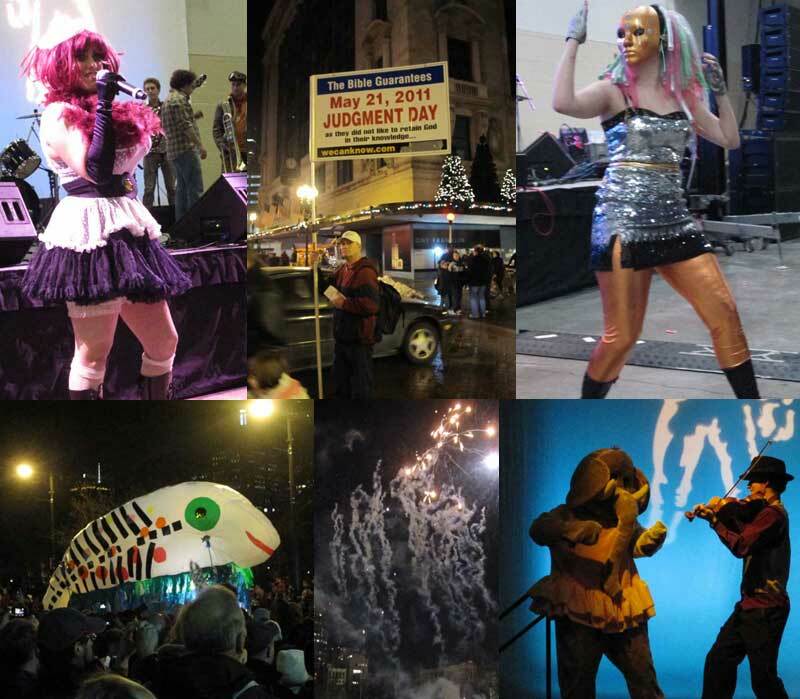 A few sights of Boston's First Night: Johnny Blazes @ the Hynes, Judgement Day, the Bunny Collective, a parade!, bright & noisy fireworks on Boston Common, Somerville Symphony Orkestra. Wow, what a busy and chaotic 2011, just one week in! While I’m swamped with new shows to list, bands to possibly profile, and a host of other things, I thought I’d show you what I did on New Year’s Eve, though it now seems like a distant memory… Only in Boston do First Night celebrations include parents with their children watching a parade, a man at Downtown Crossing advertising Judgment Day (May 21, in case you were wondering), impressive ice sculptures (melting in the unusually pleasant evening), little kids petting policemen’s horses, and a full-on protest for Palestinian rights. Such were the scenes in and around Boston Common, capped off by a wondrous and satisfyingly loud early fireworks display, and then an evening of awesome music. Happy 2011 everyone! On this New Year’s Day, Victor Robert Venckus is presenting music with the words of Kahlil Gibran, from a recording by Rosko. It’s on right now on WZBC 90.3fm or wzbc.org. If you’re sleeping in, you can also listen after the fact by visiting the WZBC Archive (all of ‘ZBC’s shows are online for two weeks). (P.S. he also played a portion of “Zodiac: Cosmic Sounds”).